Victoria Thornley says her desire to emulate Olympic champion Katherine Grainger's achievements make them a force to be reckoned with. The 28-year-old and rowing partner Grainger, a 2012 gold medallist, compete in the women's double sculls heats at the European Championships. Thornley, from Wrexham, is confident of securing a place at Rio. "With it being Katherine's fifth Olympics there's no-one else you'd want sat behind you," she said. "She knows how to handle pressure so well. "I haven't won an Olympic medal and haven't had that feeling of being on an Olympic podium. "That, of course, is what I wake up to do every day and to achieve. That brings strengths into the boat from different sides." 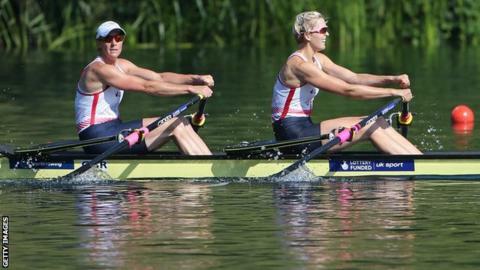 Grainger won gold in the double sculls at London 2012 with Anna Watkins after three consecutive Olympic silver medals. The 40-year-old returned in September 2014 after a two-year sabbatical. She partners Thornley at the European Championships, which get under way in Brandenburg, Germany on Friday. "Obviously it's exciting, in Olympic year, to be selected for the first race of the year," Thornley added. "But there's a long way to go in terms of sessions to do and days of training to do. "Every day I'm waking up and making sure I'm improving every single day. "Yes, we're looking to Rio but there's a lot of things to put in place before then. It's about keeping the focus on the here and now."